We've written before about the information implicit in the speculation spread, the percentage difference between an offered bid price and the post announcement stock price. As we have said, if a stock is trading for $20, a bidder offers $30 and the post announcement price moves to $25, that represents a 16.7% speculation spread. If you bought the stock at $25 and the deal closed at the bid price of $30, you'd earn 16.7%. We've also noted that the market's perception of deal completion and revision are implicit in the speculation spread and in the post announcement move of the target's stock price. In the example above (ignoring a few simplifying assumptions), the market is predicting that there is a 50% chance the deal will go through. (The $25 post announcement price represents a weighted average of a 50% chance the price would return to $20 and a 50% chance it would rise to $30.) If the deal was certain to be completed, the post-announcement market price would rise to approximate $30. In our research, we found that the average speculation spread in deals is about 2%, but that the variation in this spread is large and significantly predicts deal outcomes and time till the deal closes. Time till deal closes is important as it impacts the rate of return earned by arbitrageurs. The fact that speculation spreads are significantly related to time to closing is testimony to the importance of this time period and to the wisdom of the market. In our research, 23% of the speculation spreads were negative meaning that the post acquisition price exceeded the offered bid price. (In our opening example, this would mean the price rose to more than $30.) What is implied by a negative spread? You guessed it - a revision in the bid price by the initial bidder or another bidder. 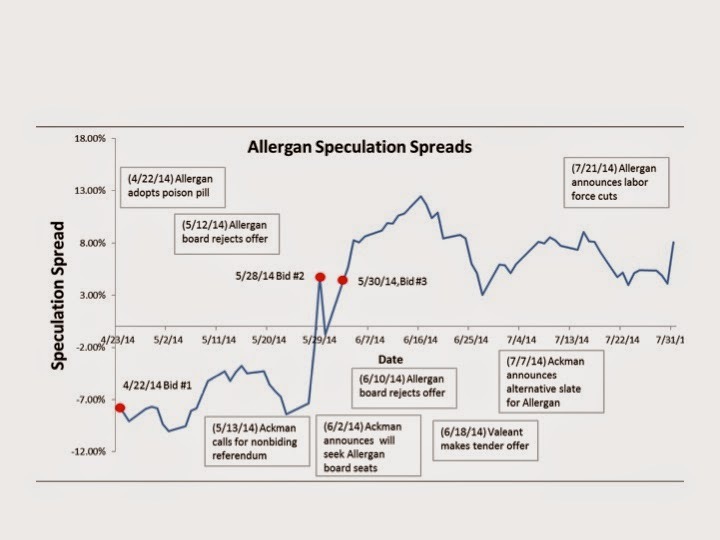 The Allergan saga continues to provide an interesting example of speculation spreads. Notice the rapid increase in stock price in the chart below. The price rises before the deal is announced, probably on speculation and dramatically when a bid is announced and Allergan adopts a defensive measure (the poison pill). The speculation spread, shown in the chart below, is also informative. Notice the negative spread, implying bid revision. It continues to be negative until - the bid is revised. Of course, the Allergan saga is not over. 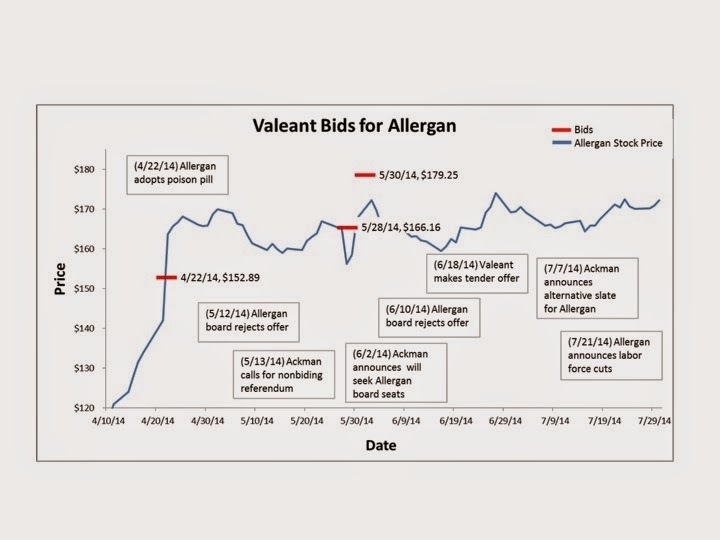 Allergan management has implemented many of the ideas espoused by Valeant, yet the stock price remains below the highest offer by Valeant and the speculation spread remains positive indicating the uncertainty that a deal would close. Meanwhile, news has surfaced that Allergan also thought about merging with Salix Pharmaceuticals in a defensive move. It will be interesting to follow this one going forward.